Verge Mobile Data recent retorfit for a SWAT rapid response vehicle that provides, both the vehicle driver and the officers being transported in the rear, heads up displays with 360° view of the vehicle surroundings. 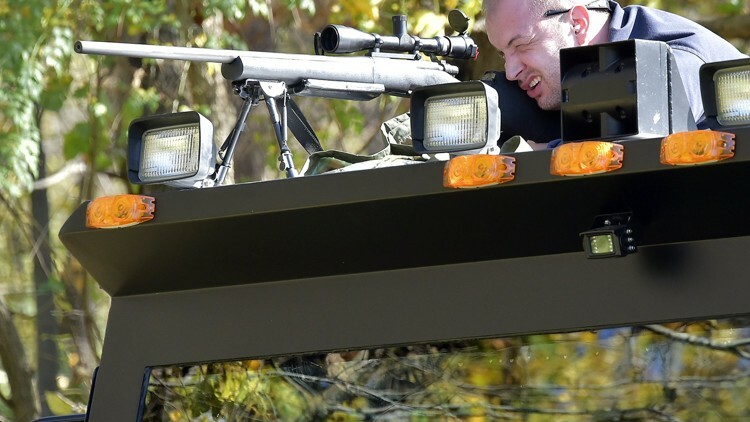 The system is IR Illuminated and gives the SWAT team a tactical advantage by allowing their approach to be made without any vehicle illumination. In-vehicle video systems continue to become more import to law enforcement and other first responders. They can be used for simple recording of officer interactions, for simple liability mitigation, or to accomplish other covert or tactical objectives. When combined with a mobile network and cellular connectivity, these systems can be monitored remotely by dispatch, or for realtime information sharing. Protect First Responders against false complaints by citizens. Reinforce professional conduct and accountability. Corroborate stories and document sequence of events. Create indisputable and court-admissible evidence. Simplify management of video and audio data. High Definition, Infra-Red Night Vision, Tamper-Resistant Cameras. Thermal Vision, Telephoto, and Other Specialty Camera Solutions. Multi-Camera Video Surveillance Viewing and Recording. Wireless, Remote Viewing of Video Feeds. Our dedicated team of security specialists understands the unique challenges faced by the First Responder community, and the technology required to address your specific needs.